Many of us have seen the word “bitcoin” (or “BTC”) thrown around, but have no idea what it means, (nor can we even begin to imagine how it could possibly come to serve as a complication in a pending divorce). In a nutshell, a bitcoin is a virtual banking currency of the internet, and completely unregulated by banks or governments. It’s a line of computer code that essentially holds monetary value (otherwise known as “digital currency”). One of its supposed advantages is that it can be stored offline in someone’s computer hardware (although the person loses access to it if they lose access to that hardware). However, Bitcoins have also been the subject of numerous scams and, of course, as an asset that can potentially be manipulated, they are thus relevant to divorce proceedings—as we discuss in greater detail below. As assets become increasingly digitized, it is arguably easier and easier to stash them away somewhere and/or give them to a trusted friend in order to hide them from the other spouse during divorce proceedings. Bitcoin makes things even more complicated as—like stocks—they could have been built up in the form of a portfolio may have taken years of work and skill. And there’s already evidence that bitcoins are being used to “squirrel away assets” in anticipation of divorce. Gains over Time or Lump Sum? In Florida, marital property is to be divided equally upon divorce. Thus, when seeking to divide bitcoins or other cryptocurrency, new questions come up when it comes to splitting up virtual currency; questions such as: should the division be based on the bitcoins’ purchase price, or their current market price? And how do you decide between negotiating for bitcoin gains over the next x number of years, or a taking a lump sum now, in the context of divorce? Laws and regulations are slow to catch up with technology like this. 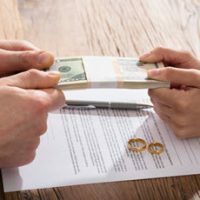 At the Arwani Law Firm in Florida, our experienced divorce and property division attorneys are focused on helping ensure that property division as the result of a divorce is in your favor and in accordance with the law. If you are contemplating or in the process of obtaining a divorce, contact us today to find out more about what we have to offer.